Affectionately known as the “worm guy,” Dr. Sudhir Nayak has indeed made a career for himself studying one of biology’s most versatile model systems:Caenorhabditis elegans, or C. elegans. “The worm is awesome,” said the associate professor of biology. He specializes in genetics and bioinformatics, weaving computer science, genetics, and quite a few worms into his research at The College of New Jersey. But Nayak didn’t always have a thing for worms. As an undergraduate at the University of Delaware, he briefly entertained the notion of entering the business world. “I was interested in the numbers mostly,” explained Nayak. “I liked the data analysis part, but I didn’t particularly care for the data I was analyzing.” He adds the move into biology was natural for three reasons: he liked learning it, he liked doing it, and he was quite good at it. 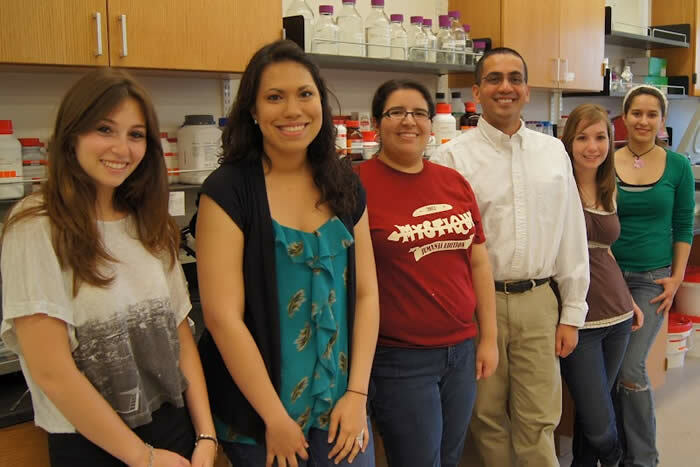 After graduating with his biology degree, Nayak spent three years as a research technician at the Wistar Institute in Philadelphia. “I couldn’t believe they were paying me to do research all the time,” he said. But all good things must come to an end, and Nayak left to attend graduate school at the University of Pennsylvania. Despite the negatives some people associate with graduate school — endless assignments and long hours hunched in the lab, with a thesis looming on the horizon — Nayak says he absolutely loved it. “A lot of people complain about graduate school, but I thought it was great,” he said. Luckily for students here at The College of New Jersey, Nayak tried his hand at teaching while earning his doctorate, serving as head teaching assistant and course coordinator. He enjoyed it so much that he continued teaching throughout his post-doctoral fellowship at Washington University (St. Louis, Missouri) and, in 2006, joined the faculty at TCNJ. It was during his time in St. Louis that Nayak first met the nematode. With its sequenced genome, rapid growth rate, and portability, it is an attractive system for both genetics and bioinformatics. “Believe it or not, we share many of the same genes with the nematode,” he explained. “When you find something of interest in nematodes, it could potentially have something to do with human biology.” And unlike studying humans, “you can do stuff to worms and no one cares because they are microscopic,” he adds. 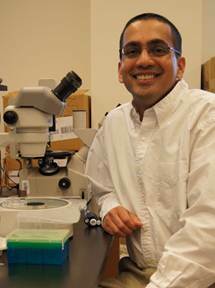 Nayak says he is proud to teach at TCNJ because it offers every student a great education and the opportunity to perform research. “I publish with my undergraduates, it’s not ‘pretend’ research. They are not doing tiny, little projects here. They are doing big projects that lead to published papers and presentations at national meetings.” In short, TCNJ students perform Research with a capital “R” and “you don’t get that at other schools, especially on the scale we offer it,” he concluded. At the end of the day, Nayak says the best part of his job is interacting with students. “To a certain extent, I like living vicariously through them,” he said. “If you help them become better learners, effective studiers, or whatever small part you have, and they go on to do something cool, I can say ‘I did that’ and selfishly take credit for something good,” he adds with a laugh.